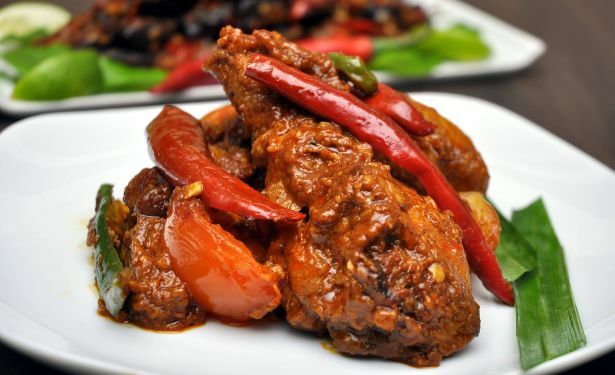 Learn how to make Ayam Masak Merah from basic, a signature Malaysian Dish that made with chicken, spice and red chill oil. It is complex, spicy yet appetizing. Marinated the chicken with turmeric powder and salt. Deep fry until 3/4 cooked, put aside. Blend the ground spices with 1 1/2 cups of water. Heat oil until hot, sauté ground spices (A) until fragrant. Add in cinnamon stick, cloves and star anise. Fry for 5 minutes. Add tomato paste and chilli sauce, stir-fry well until the tomato paste becomes oily. Then add in the chicken, pandan leaf and lemongrass together. Reduce heat and simmer until chicken is tender and gravy turns thick. Lastly add evaporated milk, chillies and tomatoes. No. 6. … Until the tomato paste is become oily….. Great English! Thanks for spotting the error. We have rectified it. We appreciate and value your support. Clear easy instructions. No.9 – for how long please? Thanks. Salam. Thank you for this tasty recipe. I’d cooked ayam masak merah for tonight dish. It turns out great and delicious. I had no tomato paste, i used fresh tomato & tomato sauce, i had no evaporated milk, i substituted coconut milk. Great ayam masak merah recipe indeed. Preferably use ayam kampong will taste better and jucier. Will try to impress my wife..